Let’s see the power of your tail! IT’S A DARE, ARE YOU WILLING TO DIVE IN WITH ME? If this is true then my beliefs are valid, too. I keep echoing, “True love & True lovers do exist in our world….Even amongst the bad…. However, it takes the right eye & of course luck to hunt them down. They’re like lotus flowers, floating away in the muddy, dirty waters. We have to swim amongst them & grab their petals on which we spend our entire life upon… Nothing is impossible now days as world is changing & so are the perceptions .” I wouldn’t refrain from confessing that yes I too wish & desire for that special someone to enter my life & make it even more special…. It’s high time people begin to appreciate and acknowledge our emotions. Encourage us to believe & support us to have faith. Allow us to swim & enhance our swimming skills, for then only we can be the masters at it! And if we’re blessed to come across such lotus flowers, why not! If YOU CAN, WHY NOT WE! Wrinkles, What do they reveal? Some people come with an energy that you really want to catch and Bindiya Kishor Farswani is that person for me. At age 31 she bubbles with the innocence of a child. So warm, loving and giving – she is an artist, a poet, a writer, runway model, a dancer – a creative in every right! The fact that she is a person who has Cerebral Palsy (CP) and she uses her wheel chair to get around does not contain her. She in fact find it liberating and unique. Her sense of humour and love for life always leave room for more. Her chase for happiness is really intriguing because it led her to joy, acceptance and gratitude. 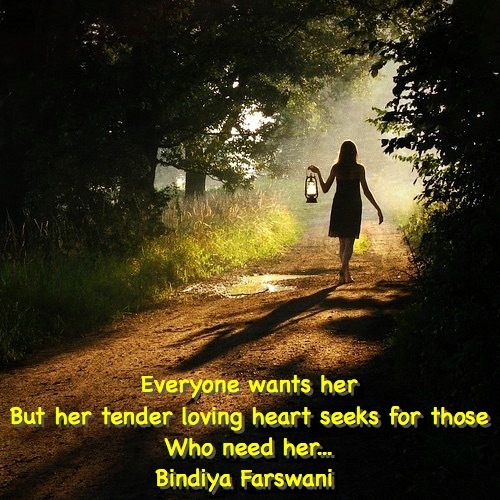 Everyone Wants her, But who Needs her…?